From the fabulous people at Hi-Tec Art comes another visually exciting device. 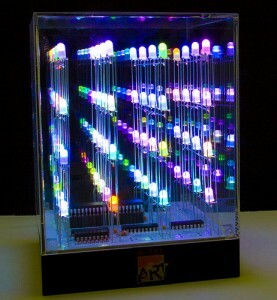 The last article described the Led Sketch board and this time it’s an amazing CUBE! It’s got 64 LED’s in a 4x4x4 display. Just plug it in and for the next 30 minutes you will have dancing lights mesmerizing you – the pattern does not repeat. And frankly, if you let it go on for longer I doubt you’ll even remember the pattern. It works best if the room is dark, but it’s still fascinating in the daytime. It’s great if you want to Get In A Zen Mood. Just sit and watch….very relaxing! and that’s just half a minute! Imagine 30 minutes or even a few hours??? Put on some ELO or Frank Zappa and just ZONE out, Dude! Next ArticleAre you a women? Interested in Win phone7?